Bruges is the capital and largest city of the province of West Flanders in the Flemish Region of Belgium, in the northwest of the country. Along with a few other canal-based northern cities, such as Amsterdam, it is sometimes referred to as The Venice of the North. Bruges has a significant economic importance thanks to its port in Zeebrugge, and was once one of the world's chief commercial cities. The area of the city amounts to 13,840 hectares (53 sq. miles), including 1,075 hectares of coastline (4 sq. miles), while the population has been holding steady at just fewer than 120,000. 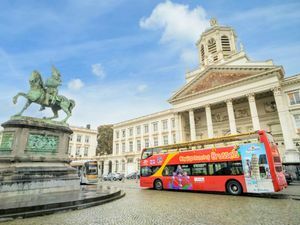 Round-trip route with on/off privileges in Brussels City! Air-conditioned buses with Wheelchair access! Easy to use system map of Brussels! Audio narration on the bus - available in 8 languages! A total of 22 Bus stops at the must-see sites!